#1: Schedule time to journal. If you don’t make it a point to schedule time in your calendar to journal, chances are you aren’t going to do it. Starting immediately, block out two 30-minute appointments a week to sit down in a quiet space and journal with the intention of awakening your creativity and strengthening your writer’s muscle. 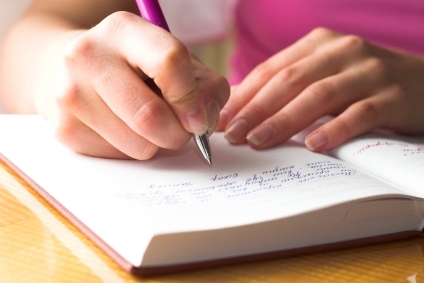 Schedule your writing sessions at different times each week and look for patterns as to when you are most prolific. #2: Start small and gradually build your writing stamina. If you are new to journaling, don’t try to do too much too soon. If you focus on writing pages and pages of thought-provoking, intelligent prose during your first 30-minute session, you will likely become disappointed when you aren’t able to meet your own expectations. When you first start writing in a journal, just aim to get a least a few sentences down on paper. Once that becomes comfortable, you can build up to writing paragraphs,and eventually, pages. If you can’t think of anything to write about, steal some of my favorite tips to get your creative juices flowing. Copy down one of your favorite quotes or a random sentence you saw scribbled on the bathroom wall at the burger joint you ate at last night. Once it’s there on paper, write an observation about it, such as how it made you feel. Or, jot down the title of a book you want to check out and explain why you are interested in reading it.